Fort Bend County is a county in the U.S. state of Texas. As of the 2010 census, its population was 585,375, making it the 10th-most populous county in Texas. In 2015 Fort Bend County had become the wealthiest county in Texas, with a median household income of $95,389 and a median family income of $105,944, having surpassed Collin and Rockwall Counties (Dallas suburbs) since the 2000 census. 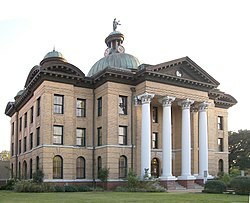 The county seat is Richmond, and its largest city is Sugar Land. Fort Bend County is included in the Houston–The Woodlands–Sugar Land Metropolitan Statistical Area. It was ranked by Forbes as the fifth-fastest growing county in the United States. The 2017 Census Bureau estimate for Fort Bend County's population is 764,828. Prior to European settlement, the area was inhabited by the Karankawa Indians. Spanish colonists had generally not reached this area during most of their colonization, settling more in South Texas. After Mexico achieved independence from Spain, Anglo-Americans started entering from the east. In 1822, a group of Stephen F. Austin's colonists, headed by William Travis, built a fort at the present site of Richmond. The fort was called "Fort Bend", since it was built in the bend of the Brazos River. The city of Richmond was incorporated under the Republic of Texas along with 19 other towns in 1837. Fort Bend County was created from parts of Austin, Harris, and Brazoria Counties in 1838. Fort Bend developed a plantation economy based on cotton as the commodity crop. Planters held numerous enslaved African-American slaves who worked as laborers. By the 1850s, Fort Bend was one of six majority-black counties in Texas. In 1860 the slave population totaled 4,127, more than twice that of the 2,016 whites. Few free blacks lived there, as Texas refused them entry. While the area began to attract white immigrants in the late 19th century, it continued as majority black during and after Reconstruction. The minority whites struggled to control freedmen and their descendants through violence and intimidation. Freedmen and their sympathizers supported the Republican Party because of emancipation, electing their candidates to office. The state legislature was still predominately white. By the 1880s, most white residents belonged to the Democratic Party. Factional tensions were fierce, as political elements had split largely along racial lines. The Jaybirds, representing the majority of the whites, were struggling to regain control from the Woodpeckers, who were made up of some whites consistently elected to office by the majority of African Americans; several had served as Republican officials during Reconstruction. Fort Bend County was the site of the Jaybird–Woodpecker War in 1888-1889. After a few murders were committed, the political feud culminated in a gun battle at the courthouse on August 16, 1889, when several more people were killed and the Woodpeckers were routed from the county seat. Governor Lawrence Sullivan Ross sent in militia forces and declared martial law. With his support, the Jaybirds ordered a list of certain blacks and Woodpecker officials out of the county, overthrowing the local government. The Jaybirds took over county offices and established a "white-only pre-primary," disenfranchising African Americans from the only competitive contests in the county. This device lasted until 1950, when Willie Melton and Arizona Fleming won a lawsuit against the practice in United States District Court, though it was overturned on appeal. In 1953, they ultimately won their suit when the Jaybird primary was declared unconstitutional by the Supreme Court of the United States in Terry v. Adams, the last of the white primary cases. In the middle 1950s, Fort Bend and neighboring Galveston County were plagued by organized crime, which was involved with the brothels and illegal casinos. A crusading newspaper editor, Clymer Wright of the Fort Bend Reporter, joined with state officials and the Texas Rangers to rid the area of such corruption. Wright defied death threats to report on the issues and clean up the community. Wright soon sold his paper, now known as the Fort Bend Herald and Texas Coaster. In the 1960s, the first of several master-planned communities that would come to define the county were developed, marking the beginning of its transformation from a largely rural county dominated by railroad and oil and gas interests to a major suburban county dominated by service and manufacturing industries. One of the earliest such developments was Quail Valley in Missouri City, whose golf course hosted the Houston Open during the 1973 and 1974 seasons of the PGA Tour. Another such development was First Colony in Sugar Land, a 9,700-acre development commenced in the 1970s by Houston developer Gerald D. Hines that would eventually become the main retail hub for the southwest Greater Houston area, anchored by First Colony Mall and Sugar Land Town Square. Since the 1980s, new communities have continued to develop, with Greatwood, New Territory, and Sienna Plantation among the more recent notable developments. In addition to continued development in the eastern portions of the county around Sugar Land and Missouri City, the Greater Katy area began to experience rapid growth and expansion into Fort Bend County starting in the 1990s, led by the development of Cinco Ranch. By 2010, the county's population exceeded 500,000, and had become the second-largest county in the Greater Houston area (behind Harris County). In 2017, Hurricane Harvey caused significant flooding in Fort Bend County, leading to the evacuation of 200,000 residents and over 10,000 rescues. The unprecedented flooding, the result of record rainfall and overflow from the Brazos River and Barker Reservoir, resulted in damage to or destruction of over 6,800 homes in the county. According to the United States Census Bureau, the county has a total area of 885 square miles (2,290 km2), of which 861 square miles (2,230 km2) are land and 24 square miles (62 km2) (2.7%) are covered by water. From 1930 to 1950, the county showed a decline in the rate of expansion and even a decrease in population. This was a period when many African Americans migrated in the second wave of the Great Migration from Texas and other parts of the South to the West Coast, where a buildup in the defense industry provided more job opportunities. Other minorities have settled in the county during its residential development, and African Americans are now a minority. As of the census of 2000, 354,452 people, 110,915 households, and 93,057 families resided in the county. The population density was 405 people per square mile (156/km²). The 115,991 housing units averaged 133 per square mile (51/km²). The racial or ethnic makeup of the county was 56.96% White (46.21% White non-Hispanic), 19.85% Black or African American, 0.30% Native American, 11.20% Asian, 0.04% Pacific Islander, 9.10% from other races, and 2.56% from two or more races. About 21.12% of the population was Hispanic or Latino of any race. Other self-identifications were 8.8% of German ancestry, 6.3% American, and 5.8% English ancestry according to the 2000 United States Census. In 2006, Fort Bend county had a population of 493,187. This represented a growth of 39.1% since 2000. The county's racial or ethnic makeup was 53.96% White (39.63% White non-Hispanic), 20.88% African American, 14.77% Asian, 0.51% Native American, 7.73% other races, and 2.14% from two or more races. About 22.88% of the population was Hispanic or Latino of any race; 23.82% of the population was foreign born; of this, 50.24% came from Asia, 37.17% came from Latin America, 5.74% from Africa, 5.28% from Europe, and 1.57% from other parts of the world. In 2000, of the 110,915 households, 49.80% had children under the age of 18 living with them, 68.80% were married couples living together, 11.40% had a female householder with no husband present, and 16.10% were not families. About 13.50% of all households were made up of individuals, and 3.10% had someone living alone who was 65 years of age or older. The average household size was 3.14 and the average family size was 3.46. In the county, the age distribution of the population was 32.00% under the age of 18, 7.60% from 18 to 24, 32.30% from 25 to 44, 22.40% from 45 to 64, and 5.70% who were 65 years of age or older. The median age was 33 years. For every 100 females, there were 99.10 males. For every 100 females age 18 and over, there were 96.30 males. As of 2002, the largest two cities within Fort Bend County were Missouri City and Sugar Land, with portions of Houston combining to make up the county's third-largest "city". In that year, 38,000 residents of the City of Houston lived in Fort Bend County. According to the 2008 American Community Survey, the median income for a household in the county was $81,456, and for a family was $90,171. Males had a median income of $54,139 versus $41,353 for females. The per capita income for the county was $30,862. About 5.50% of families and 7.10% of the population were below the poverty line, including 8.50% of those under age 18 and 9.40% of those age 65 or over. As of 2006, Fort Bend County is the wealthiest county in Texas, with a median household income of $95,389 and a median family income of $105,944, having surpassed Collin and Rockwall Counties (Dallas suburbs) since the 2000 census. However, the Council for Community and Economic Research ranked Fort Bend County as America's third-wealthiest county when the local cost of living was factored into the equation with median household income. However, this estimate does not include property taxes and local taxes, as effective tax rates and home insurance were not measured. Fort Bend County, along with other Texas counties, has one of the nation's highest property tax rates. In 2007, it was ranked fifth in the nation for property taxes as a percentage of the homes' value on owner-occupied housing. The list only includes counties with a population over 65,000 for accuracy. Fort Bend County also ranked in the top 100 for property taxes paid and for percentage of taxes of income. Part of this is due to the complex Robin Hood plan school financing law that exists in Texas. Since the 1970s, Fort Bend County has been attracting people from all ethnic backgrounds. According to a 2001 Claritas study, it was the fifth-most diverse U.S. county, among counties with a population of 100,000 or more. It is one of a growing number of U.S. counties with an ethnic plurality, with no single ethnic group forming a majority of the population. Fort Bend County also has the highest percentage of Asian Americans in the Southern United States; the largest groups are of Vietnamese, Chinese, Indian, and Filipino ancestry. By 2011, Fort Bend was ranked the fourth-most racially diverse county in the United States by USA Today. The newspaper based the ranking on calculating the probability that two persons selected at random would be of different ethnic groups or races. According to the USA Today methodology, the chance of people of being two different ethnic groups/races being selected was 75%. Karl Eschbach, a former demographer with the State of Texas, said in a 2011 Houston Chronicle article that many people from Houston neighborhoods and communities with clear racial identities, such as the East End, Sunnyside, and the Third Ward, moved to suburban areas that were too new to have established racial identities. Eschbach explained "[a]s a large minority middle class started to emerge, Fort Bend was virgin territory that all groups could move to." County politics in Fort Bend County, as with all counties in Texas, are centered around a commissioners' court. It is composed of four popularly elected county commissioners, one representing each precinct drawn decennially on the basis of population, and a county judge elected to represent the entire county. Other county officials include a sheriff, district attorney, tax assessor-collector, county clerk, district clerk, county treasurer, and county attorney. Historically, Fort Bend County was for decades a stronghold for the Democratic Party, having achieved disenfranchisement of blacks at the county level (1889) in the aftermath of the Jaybird–Woodpecker War. The state effectively disfranchised blacks by imposition of a poll tax and white primaries; the latter device was declared unconstitutional in 1944. By 1960, so few Republicans resided in Fort Bend County that the county's Republican chair once received a letter addressed simply to "Mr. Republican". However, as the 1960s progressed, rapid suburban-style development in west and southwest Houston began to overflow into Fort Bend County, where the development of numerous master-planned communities attracted many upper-middle class families to developments in the eastern portion of the county. This development, along with the shift of conservative white Democrats towards the Republican Party in the wake of the Voting Rights Act of 1965, led to increased support for the GOP in the following years. Richard Nixon narrowly carried the county in 1968, making it the only county in Greater Houston outside of Harris County to go Republican that year, and would carry it again in his 1972 landslide. In 1976, conservative physician Ron Paul of Brazoria County, noted for his opposition to most government programs, which earned him the nickname "Dr. No", captured the 22nd district in the United States House of Representatives in a special election, before narrowly losing re-election in the November election that also had Gerald Ford win Fort Bend, despite losing Texas to eventual winner Jimmy Carter. Beginning in 1978, Republicans began to win several offices within the county, with William P. Clements carrying the county in his successful run for governor. That same year, Paul was returned to Congress, while businessman Tom DeLay captured the county's seat in the Texas House of Representatives. In 1984, DeLay succeeded Paul in Congress after the latter ran for an unsuccessful U.S. Senate campaign, and eventually became House majority leader by 2002. From 1982 onward, Republicans began to win a number of county-level offices and judgeships, and Fort Bend County's new reputation as a Republican stronghold culminated in the 1994 election of a Republican county judge to the commissioners' court for the first time since Reconstruction. As of 2016, every elected countywide office in Fort Bend County, as well as a majority of precinct-level positions, is held by Republicans. However, with growing populations of minorities and more socially moderate suburban voters who often break Republican on fiscal and economic issues, Fort Bend County has become more competitive, recently. In 2008, Democrat Barack Obama came very close to winning the county in heavy voting, with 48.6 percent of the vote compared to 50.9% for Republican John McCain. Eight years later in 2016, Hillary Clinton became the first Democrat to carry the county since Texas' own Lyndon B. Johnson in 1964, largely due to the unpopularity of Republican nominee and eventual winner Donald Trump among many minority and suburban voters nationally, who ended up splitting their tickets between Clinton and an otherwise straight Republican vote; Republicans won every elected countywide office by a margin similar to Clinton's, while also defeating an incumbent Democrat on the Fort Bend County Commissioners' Court. In 2018, significant enthusiasm from Beto O' Rourke and a strong Democratic infrastructure, resulted in Democratic control of the Commissioners' Court (including County Judge) and a number of countywide administrative and judicial posts, with Fort Bend Independent School District board trustee KP George becoming the State of Texas' first Asian-American County Judge. 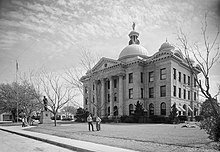 The county is often considered a swing county in Texas politics, with election results usually tilting more Democratic than the overall statewide results which almost always turn out in favor of the Republican Party nowadays. Elections within the county are often decided by margins in more Republican-leaning areas in Sugar Land, Rosenberg, and southern Missouri City, with Republicans dominating in the Katy, Fulshear, and rural southern areas of the county and Democrats having their stronghold in the county's northeast corner around northern Missouri City and Fresno, as well as heavily Hispanic Mission Bend (north of Sugar Land). Since the passage of the Voting Rights Act of 1965, the federal government has enforced it by regularly reviewing voting patterns and local practices, and plaintiffs have sometimes sued state or local governments over discriminatory practices. In April 2009, as part of a settlement with the United States Department of Justice, officials of Fort Bend County agreed to increase assistance to Spanish-speaking Latino voters in elections held in the county. 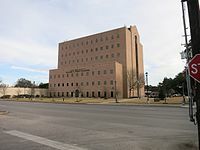 The Fort Bend County Jail is located at 1410 Williams Way Boulevard in Richmond. The TDCJ announced that the Central Unit in Sugar Land was closing in 2011. The City of Sugar Land is exploring the property for future economic development, including light industrial uses, as well as a potential expansion of Sugar Land Regional Airport. Fort Bend County Justice Center at 1422 Eugene Heimann Cir. In contrast to Greater Houston in general, Fort Bend County's economy tends to be more diverse, with numerous service-sector jobs in healthcare, energy, education, hospitality and other areas. Major companies with a presence in the county include Schlumberger, Minute Maid, Fluor and Sunoco's logistics operations in Sugar Land. The Houston Business Journal reported in 2010 that the diversity of industries promoted decades of rapid population growth. After Memorial Hermann Hospital and St. Luke's Episcopal Hospital opened facilities in Fort Bend County, already home to local facilities for Houston Methodist Hospital in Sugar Land, as well as locally based OakBend Medical Center in Richmond, numerous doctors moved their offices to the county. Compared to Montgomery County, which has experienced rapid growth in corporate employment following ExxonMobil's decision to move its Greater Houston operations to an area directly south of The Woodlands, Fort Bend County has yet to experience significant corporate growth, even though Schlumberger recently announced plans to move its North American headquarters to Sugar Land. Kendleton Independent School District closed in 2010. 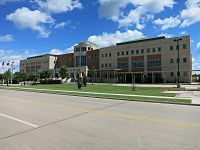 Fort Bend County Libraries operates many libraries in the county. Houston Public Library operates one branch in the county. Local newspapers in the county include three weeklies, the Fort Bend Star, headquartered in Stafford, and the Fort Bend Independent and Fort Bend Sun, headquartered in Sugar Land, as well as the daily Fort Bend Herald and Texas Coaster which focuses on news coverage in the Richmond-Rosenberg area. Fort Bend County is also a major service area for the Houston Chronicle, which provides separate local coverage for the Sugar Land and Katy areas. ^ a b "2015 American Community Survey: Fort Bend County, Texas". census.gov. 2015. Archived from the original on 2016-05-18. Retrieved 2016-01-21. ^ "Texas: Individual County Chronologies". Texas Atlas of Historical County Boundaries. The Newberry Library. 2008. Archived from the original on May 13, 2015. Retrieved May 23, 2015. ^ Kotkin, Joel. "No 5: Fort Bend County, Texas - pg.5". Forbes. Archived from the original on 30 December 2017. Retrieved 24 April 2018. ^ a b "American FactFinder". Archived from the original on March 16, 2017. Retrieved March 23, 2018. ^ a b c Yelderman, Pauline (2010). "Handbook of Texas Online: JAYBIRD-WOODPECKER WAR". Texas State Historical Association. Archived from the original on December 14, 2013. Retrieved February 22, 2014. ^ Hayes, Bonni C. (2010). "Handbook of Texas Online: ARIZONA FLEMING". Texas State Historical Association. Archived from the original on July 14, 2014. Retrieved July 5, 2014. ^ Johnson, Paul (2000). A History of the American People. Orion Publishing Group, Limited. p. 661. ISBN 978-1-84212-425-3. ^ "Doug Miller, "Clymer Wright, conservative term-limit advocate, found dead in his home", January 25, 2011". KHOU-TV. Archived from the original on March 31, 2012. Retrieved January 27, 2011. ^ "About Fort Bend Herald and Texas Coaster". fbherald.com. Archived from the original on January 29, 2011. Retrieved January 28, 2011. ^ "Quail Valley's History: Golf, Special Events & Restaurant". www.golfquailvalley.com. Retrieved 2018-07-06. ^ Company, One Design (2018-07-04). "First Colony - Sugar Land - Properties – Hines". Hines. Retrieved 2018-07-06. ^ "History | Fort Bend County, TX". www.fortbendcountytx.gov. Retrieved 2018-07-06. ^ E., JASINSKI, LAURIE (2010-06-12). "CINCO RANCH, TX". tshaonline.org. Retrieved 2018-07-06. ^ "Hurricane Harvey damaged or destroyed 6,800 homes in Fort Bend, officials say". Houston Chronicle. 2018-03-14. Retrieved 2018-07-06. ^ "2010 Census Gazetteer Files". United States Census Bureau. August 22, 2012. Archived from the original on April 19, 2015. Retrieved April 26, 2015. ^ "Texas Almanac: Population History of Counties from 1850–2010" (PDF). Texas Almanac. Archived (PDF) from the original on February 26, 2015. Retrieved April 26, 2015. ^ "Demographic Profile Bay Area Census". Archived from the original on 2006-03-30. ^ De Mangin, Charles. "Neighborhood charts its course Archived 2012-05-04 at the Wayback Machine." Houston Chronicle. Thursday November 14, 2002. Retrieved on October 27, 2011. ^ American FactFinder, United States Census Bureau. "Fort Bend County, Texas - Selected Economic Characteristics: 2006–2008". Factfinder.census.gov. Archived from the original on 2011-06-06. Retrieved 2010-07-22. ^ Cost of Living Can Significantly Affect "Real" Median Household Income Archived 2008-07-02 at the Wayback Machine, Council for Community and Economic Research website. Retrieved December 9, 2007. ^ "Property Taxes on Owner-Occupied Housing by County, 2005 - 2008, Ranked by Taxes as Percentage of Home Value". The Tax Foundation. 2009-09-22. Archived from the original on 2010-04-29. Retrieved 2010-07-22. ^ Postrel, Virginia (October 7, 2004). "Economic Scene; A Texas experiment that shifts money from rich to poor school districts is turning into a major policy disaster". The New York Times. Archived from the original on June 6, 2009. Retrieved May 2, 2010. ^ "Claritas Study Ranks Racial/Ethnic Diversity in Counties Nationwide; Analysis Shows California Leads Nation In Diversity Among Counties Of 100,000-Plus Population". Business Wire. July 23, 2001. Archived from the original on July 8, 2012. ^ Kever, Jeannie. "FACING A CROSSROADS Archived 2011-06-05 at the Wayback Machine." Houston Chronicle. June 1, 2011. Retrieved on June 3, 2011. ^ "Party History". archive.org. 20 November 2002. Archived from the original on 20 November 2002. Retrieved 24 April 2018. ^ a b Bernstein, Alan and Zen T. C. Zheng. "Fort Bend accepts vote decree Archived 2009-04-12 at the Wayback Machine," Houston Chronicle. April 10, 2009. Retrieved on April 11, 2009. ^ reporter, kevin quinn, eyewitness news, (2016-11-10). "Political shift in Ft. Bend leans toward Clinton". ABC13 Houston. Archived from the original on 2016-11-10. Retrieved 2016-11-10. ^ reporter, Margaret Kadifa (2016-11-14). "Clinton wins FB County, Republicans dominate local races". Houston Chronicle. Archived from the original on 2016-11-23. Retrieved 2016-11-22. ^ Leip, David. "Dave Leip's Atlas of U.S. Presidential Elections". uselectionatlas.org. Archived from the original on 23 March 2018. Retrieved 24 April 2018. ^ "Commissioner's defeat leaves 1 Dem on Fort Bend County board". timesunion.com. Archived from the original on 24 April 2018. Retrieved 24 April 2018. ^ "Detention." Fort Bend County. October 3, 2006. ^ "JESTER III (J3) Archived 2008-08-21 at the Wayback Machine." Texas Department of Criminal Justice. Retrieved September 14, 2008. ^ "VANCE (J2) Archived 2008-08-21 at the Wayback Machine." Texas Department of Criminal Justice. Retrieved September 14, 2008. ^ "JESTER I (J3) Archived 2008-08-21 at the Wayback Machine." Texas Department of Criminal Justice. Retrieved September 14, 2008. ^ "JESTER IV (J4) Archived 2008-08-21 at the Wayback Machine." Texas Department of Criminal Justice. Retrieved September 14, 2008. ^ Ward, Mike. "Texas closing prison as part of cutbacks Archived April 1, 2012, at the Wayback Machine." Austin American-Statesman at KDH News. Wednesday August 3, 2011. Retrieved on September 23, 2011. ^ "Fort Bend County tops Forbes growth list." Houston Business Journal. Tuesday February 2, 2010. Retrieved on February 8, 2010. ^ Latson, Jennifer. "Businesses finding the suburbs superb Archived 2010-09-12 at the Wayback Machine." Houston Chronicle. May 18, 2010. Retrieved on May 24, 2010. 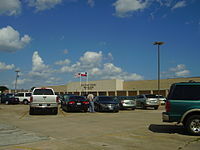 Wikimedia Commons has media related to Fort Bend County, Texas.